In my ongoing quest to make as many awesome decisions as I can before I die, I got another tattoo. Well, two, actually. But since I had to space them a few weeks apart, I’ve decided to post them one at a time. This masterpiece of blinding awesomeness, I got for my 31st birthday. It’s not an original idea by any stretch of the imagination. In fact, I’ve seen a few others very similar to it sported by fellow fans of a particular band from New Jersey. I even considered not getting it for that very reason. Because, as much as I love them (the band; I don’t really know the fans), I didn’t want it to come off as just a cookie cutter homage to them because I was shooting for something a little bigger. 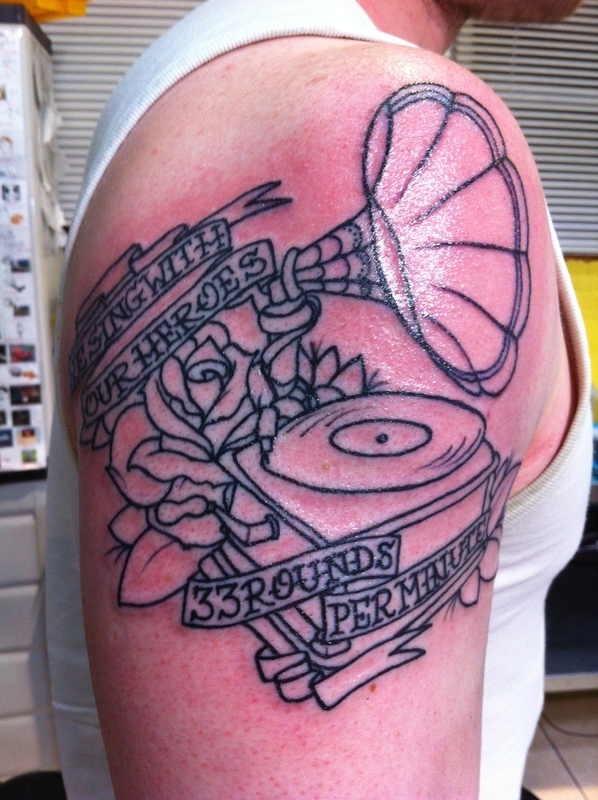 I wanted something to mark my love of music in general, not one act in particular. My wife initially suggested that I get a guitar tattoo since that’s what I play. 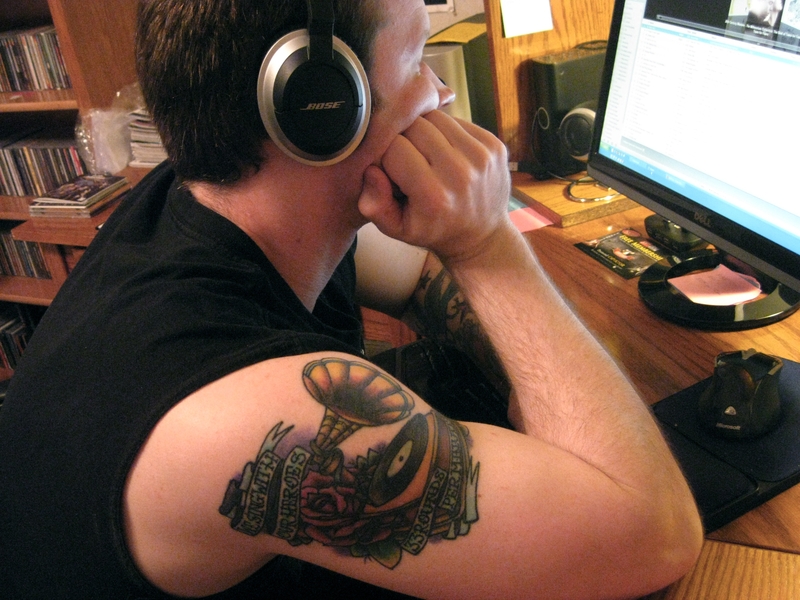 But a guitar tattoo would suggest that I’m more proficient on the instrument than I actually am. And the last thing I would want is a bunch of people saying, “So you must be pretty good, huh?” and me having to respond with, “Define ‘good. '” But, who knows, maybe one day when I know more than one scale. Besides, I had had the gramophone in mind for a while and was thinking more along the lines of how some songs/albums become almost a part of our DNA. If you stop and think about it, it really is a very personal, mysterious and powerful thing. I still remember listening to my parents Motown records as a kid and the Sam Cooke tape that my mom and I would play over and over in the car while she was driving me to school. All those songs feel like home to me now. Probably still will when I’m eighty. And, sure, an iPod would have been a more accurate depiction of my current listening habits, but where’s the romance and nostalgia in that? Don’t get me wrong, I love my iPod, but pressing “play” will never offer the same sense of satisfaction as dropping the needle on a record. Now, as far as the rose goes, I’ve read somewhere that it is a symbol of timeless beauty, among other things. And I could certainly sit here and wax poetic on how that symbolism ties in with the essence of great music and how both a song and a rose, with its thorns, can be both beautiful and painful at the same time and blah, blah, blah….and that would all be true. But at the end of the day, it just looks really $%&@ing cool. 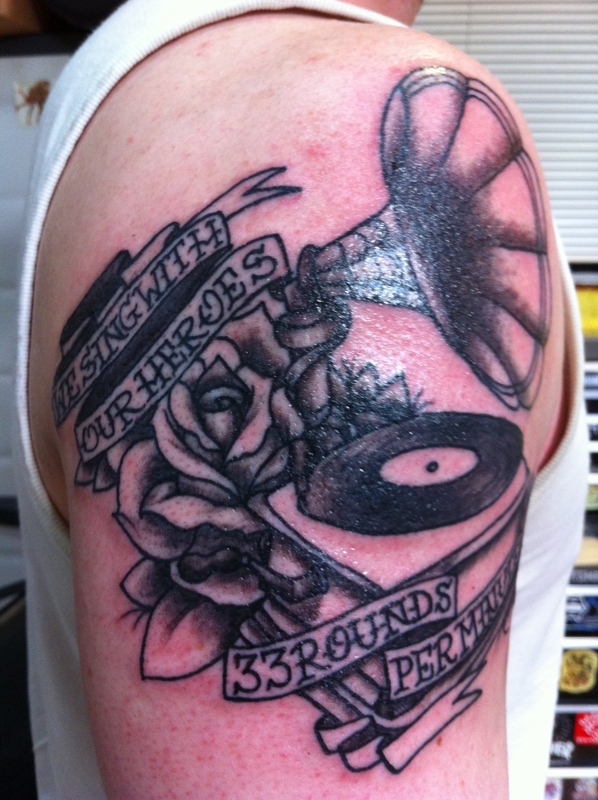 The quote says, “We sing with our heroes 33 rounds per minute.” It’s from a song called “Blue Jeans & White T-Shirts” by The Gaslight Anthem, that particular band from New Jersey I mentioned earlier and one of my favorites. It’s a really popular line for fans to get tattooed and, as I previously stated, that fact initially gave me pause. But I soon realized that I wasn’t going to find a better line to sum up my feelings on the subject. And, in the end, who cares how many people have the same line tattooed on them. It’s brilliant. More people should have it. 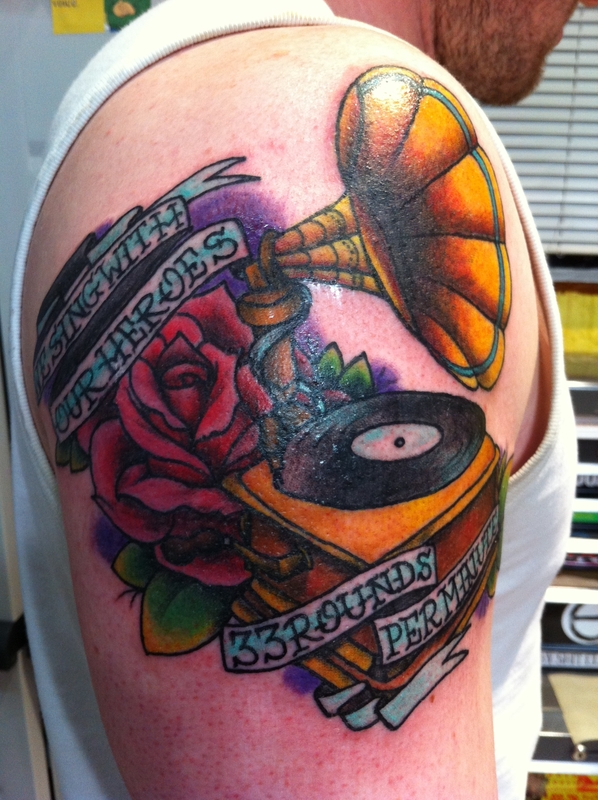 Like the song says, “We like our choruses sung together/We like our arms in our brothers’ arms.” If some of those arms happen to have similar tattoos on them, even better. Because music and life are best when shared. So why not tattoos? Anyway, I’m exceedingly happy with how the tattoo turned out. It was, indeed, an awesome decision. I did, however, foolishly go into it thinking that getting tattooed on my shoulder would somehow be less painful than the inside of my forearm. And I was wrong. It hurt more. It was still bearable and I walked out with my dignity still largely intact, but, damn, that was a long four hours. Worth it. And for anyone who hasn’t heard it, here is “Blue Jeans & White T-Shirts” by The Gaslight Anthem. It’s brilliant in both its simplicity and its emotional punch and is definitely tattoo worthy. I could go on and on, but it’s probably best that I shut up and just let you listen to the song. Enjoy. ← The Jerk Store: It Called.